Cartoon showing an expensive racing bike, bought in the sporting enthusiasm at the end of the Olympic games, abandoned and neglected in the back of a garage. Cartoon showing customers leaving a sports footwear shop wearing new running shoes. The running shoes have ‘blades’ instead of soles. Curved springs similar to running blades were worn by dancers in the olympic opening ceremony if I’m not mistaken. Nike is not only the name of the Greek goddess of victory, which appears on all Olympic medals – it’s also the name of a running shoe brand. Nike, the sports shoe company, could be said to benefit by association with the fact that Nike the greek goddess is depicted on all medals in the Olympics. A sort of subliminal product placement. 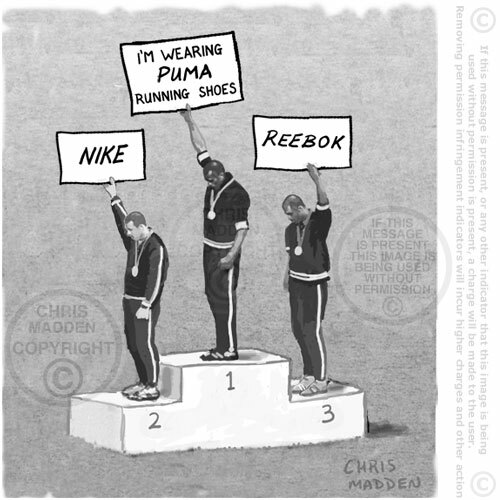 The cartoon implies that other running shoe manufacturers are unhappy about this, and have managed to impose a ‘gagging order’ on the press so that they can’t mention the fact that Nike is on the medals (which is perhaps the reason why so few people realise that she is). A cartoon about product placement and sponsorship in the Olympic games. Showing empty seating in the Olympic stadium allocated to organisations linked to the Olympic Games. The people whom the seats were given to haven’t bothered to turn up. Security firm G4S recruited far too few security personnel for the 2012 Olympics in London. The cartoon links the fact that security firm G4S fell short on staffing levels with the fact that the allocated hospitality seating at the Olympics had a shortfall in users. Cartoon about copyright of the olympic rings logo. The IOC (International Olympic Committee) keeps a very tight rein on the unauthorised use of the olympic rings symbol. A cartoon about olympic commercialization and the copyright restrictions imposed on the use of olympic logos using copyright law and trademark law, and about merchandising, marketing and monetizing the olympic games. The increasing commercialisation of the Olympic Games is shown by the way that small community projects and individuals are not allowed to use any trademarked olympic terms or objects – sometimes right down to local groups not being allowed to put the olympic rings in the icing on cakes. This gag shows a pedestrian trying to cross the road by walking across an Olympic traffic lane and being fined £130 for the ‘offence’ by an officious traffic warden. The ArcelorMittal Orbit was designed by Anish Kapoor and Cecil Balmond as a legacy sculpture in the 2012 Olympic Park in Stratford, London. 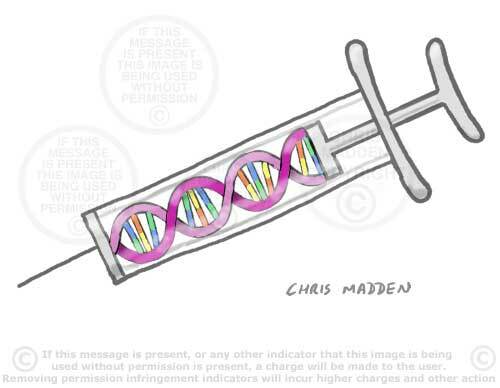 This cartoon was drawn in 2012 when the sculpture was first built. An actual ‘fairground’ slide was added in 2016 (by Carsten Höller, previously best known in Britain for installing slides in the Tate Modern turbine hall). The ArcelorMittal Orbit is often compared with a collision between the Eiffel Tower, a big dipper and a helter skelter, which is the subject of this cartoon. I’m not sure why I’ve never heard it compared with Tatlin’s Tower. I’m also surprised that I’ve never heard it described as the wreckage that’s the result of megalomaniacal artistic hubris over-reaching itself. The main reason that the Orbit resembles a fairground attraction is the appearance of the mesh that encases the stairs, which spiral round the structure just like the slide on a helter skelter. This mesh is, I think, a compromise in the design, due to the restrictions imposed by health and safety regulations. Early versions of the design lacked this feature. I’ve often thought that Anish Kapoor’s work had something of the fairground or amusement arcade about it – especially his distorting mirrors which resemble the mirrors found in a hall of mirrors. In the cartoon the Olympic stadium is hosting the Final of the 100 metres dodgem race. Cartoon about copyright infringement and the olympic rings logo. In this cartoon a policeman or security guard is apprehending someone in a café because the rings of his coffee cup have inadvertently created the olympic rings logo. The theme is about merchandising, marketing and monetizing the olympic games. The increasing commercialisation of the Olympic Games is shown by the way that small community projects and individuals are not allowed to use any trademarked olympic terms or objects – seemingly right down to local groups not being allowed to put the olympic rings in the icing on cakes. Merchandising, marketing and monetizing the olympic games. An oplympic winners’ podium with adverts on it. A cartoon about sponsorship in sport and sports merchandising. Illustration showing an olympic advertising podium. A cartoon about the commercialisation of sport, commercialization of the olympics, product endorsement, sports’ equipment endorsing, sporting celebrity marketing, product placement. The increasing commercialisation of the Olympic Games is shown by the way that small community projects and individuals are not allowed to use any trademarked olympic terms or objects – right down to local groups not being allowed to put the olympic rings in the icing on cakes. I’ve drawn a cartoon based on the famous black power salute in order to emphasise how much the western world has moved away from the political idealism of the late 1960s to the obsession with marketing of the current era. 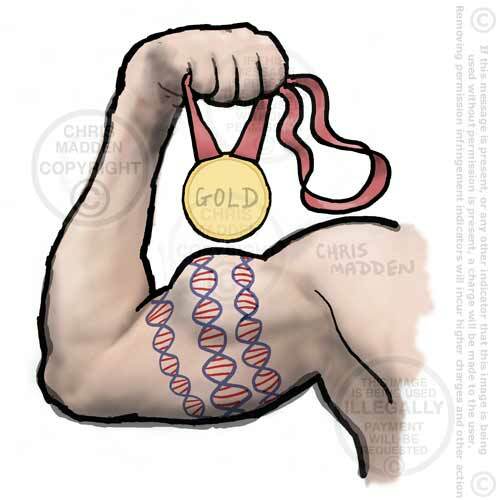 This cartoon was drawn at the time of the 2012 Olympics. A cartoon about the commercialisation of sport, commercialization of the olympics, product endorsement, sports’ equipment endorsing, sporting celebrity marketing, running shoes advertising, advertising placards, hoardings. 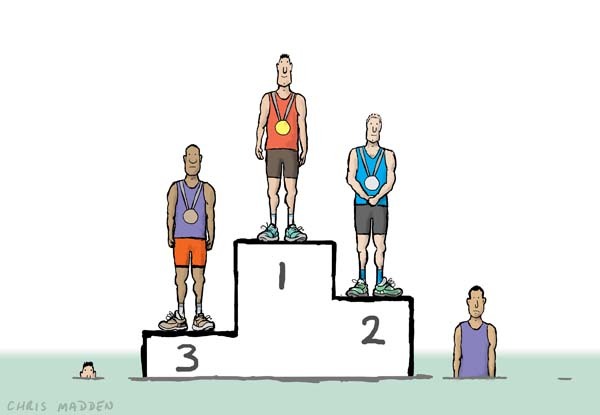 An athletics cartoon or Olympics cartoon showing competitors on the podium. Illustration showing the concept that if you’re not in the top three you’re nowhere. 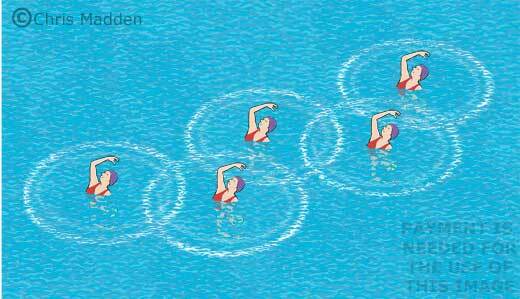 The Olympic rings logo being created by synchronized swimming.